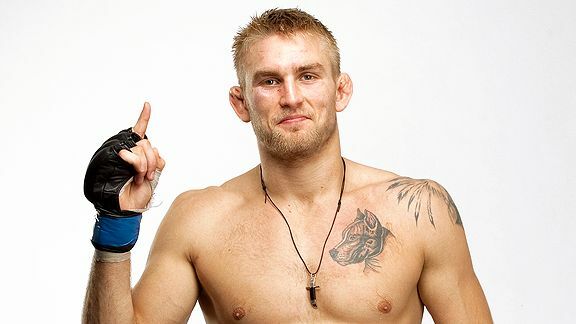 Is Gustafsson an entertaining fighter to you? Discussion in 'UFC Discussion' started by Yrat, Jan 3, 2013. This swedish fighter has an impressive win-streak in 205 lbs, he have won his fights by tko or rear naked choke, but is he an interesting fighter to watch according to you? It is good that he speak english , but 99% of his interview is just cliche. In UFC the the only way is to thrashtalk like Chael Sonnen to get something or deliver very exciting fights. I would say that the Korean Zombie is the most interesting non-american/brazilian fighter at the moment since he knows how to make a fight to remember. Will this explain why he will not get the title? Well he seems entertained yes. He looks like he has fun on this pic. Gustafsson's the best prospect UFC's got. He's going to get a title shot, just be patient. No. If he doesn't get the title it will be because of skill level. I don't see how having a European champ does anything but help Dana take over the world. A fighter that uses very clean striking technique with power behind his punches is always entertaining. As we saw with his fight with Shogun he's not afraid to go blow for blow against an opponent who has landed BOMBS on his chin. Most guys would get rocked and abandon their gameplan after taking one of those. AG just kept on going like nothing happened. He's pretty great. I'm a fan. how does one thrash talk? always have been a Gus fan. the guys not overly flashy or dynamic but he's solid and hes more genuine then say..um...jones?! lol WAR Gus! UFC can do a better job entertaining Gus. He's not one of my favorite guys but sure, he's entertaining. Also, surely you mean he will not get a shot(which he will by the way). people forget that he started out as a brawler who had a great chin and now he trains with Dominick Cruz. the mauler is the man. I like him, but I'll admit that his past couple of fights have been a bit on the dull side.